Are there areas in your house where your Wi-Fi connection is weak? It’s not unusual, especially for large or tri-level homes, to get “dead zones” where a wireless signal isn’t picking up very well. Just a few years ago, there wasn’t much you could do about it, other than trying to install a Wi-Fi extender, but they still have issues with strength and getting through solid brick walls. Luckily, there’s a new technology that’s not only hot right now, it’s designed to overcome wireless signal issues. In essence, you have a little army of “mini routers” that you can deploy throughout your home to give you a strong signal wherever you need it. It’s called a Wireless Mesh Network. abcd TECH was founded on the principal of removing tech anxiety and providing friendly tech support in Wichita for all types of home devices beyond just computers and smartphones, so when wireless mesh networks first became a “thing” we were on it! 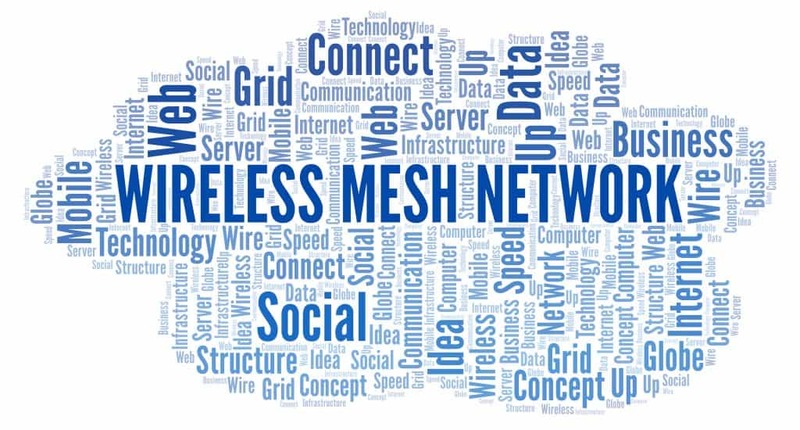 We are always bringing the best that technology has to offer to our clients to make their lives better, and wireless mesh is one of those new advances. So, how does it work, and what can you expect to pay for a wireless mesh network? We’ve got a full primer for you below. If you’ve been wanting to strengthen your wireless signal, extend Wi-Fi to other parts of your property (a garage or patio), or just enjoy surfing online without any dead zone hassles, you’ll want to read on! A wireless mesh network consists of a main router that connects to your modem (just like you’re probably using now) and it adds a series of satellite units, also known as nodes, which you place around your home to get full Wi-Fi coverage in every nook and cranny of your house. Each satellite unit communicates with the main router and forms a web, or mesh, of strong Wi-Fi coverage to blanket your home and get rid of any dead spots. The satellite units are about the size of a coffee thermos or soup bowl and can be placed on top of tables or bookshelves or attached to walls. They function as small radio transmitters and are completely wireless. Homes are getting smarter every year with more internet connection needs than ever. There are smart TVs, voice activated assistants (like Amazon Echo), smart security doorbells, and even internet-connected baby monitors. What are some of the top wireless mesh options to keep all those smart home devices connected online? If you’re interested in exploring wireless mesh networks further, here are a few of the top brands that abcd TECH has checked out for you. We’ve also included pricing so you can more easily compare each one. The wireless mesh by eero has a sleek, white exterior to the units (very “Mac-like) and the devices are flat and rectangular. The router has a range of 1,500 S.F. and each satellite adds another 1,000 S.F. You can pay a little less when you order the hub and satellites in sets. Google Wifi’s units are round and also white to blend with any décor. They don’t differentiate between the router and the satellite, they just say to connect the first unit you install to your modem. Each unit has a range of 1,500 S.F. The wireless mesh units from Netgear are taller than Google’s or eero’s and have an oval shape. They’re white with a light blue ring at the top. They have a larger selection of unit types including indoor, outdoor, and wall plug units. Their routers have a range of over 2,000 S.F. and the satellites add 1,500 – 2,500 S.F., depending upon type. Need Some Help Extending Your Wi-Fi Network? Whether you need a personalized wireless mesh set up, would like help making the most of your smart TV, or are thinking of getting that new Facebook Portal to video chat with family, abcd TECH can get your technology working for you in no time. Give us a call today to schedule your smart home consultation at 316-768-7832.